In October 1962, the world held its breath. On the edge of the Caribbean Sea, just a few miles from the Florida coast, the two great superpowers were at a stand-off. Surrounded by twelve US destroyers, which were depth-charging his submarine to drive it to the surface, Captain Vitali Grigorievitch Savitsky panicked. Unable to contact Moscow and fearing war had begun, he ordered the launch of his submarine’s nuclear torpedoes. As the two sides inched perilously close to nuclear war—far closer than we ever knew before–just one man stood between Captain Savitsky’s order and mutually assured destruction. Set over four hours on October 27, 1962, the tensest moments of the Cuban Missile Crisis, this program tells the powerful but forgotten story of Vasili Arkhipov and Soviet submarine B-59. With most of the action set in a claustrophobic submarine running out of air, “The Man Who Saved the World” combines tense drama with eyewitness accounts and expert testimony about some of the most critical events in the Cold War. Copyright 2012 Bedlam Production Ltd.
Everybody’s got a nuke in their pocket. One spark would set it off. The world held its breath as four Soviet submarines, armed to the teeth with nuclear weapons, set off for Cuba while the US Atlantic fleet went on the hunt. We were looking toward Russia and seeing a country that wanted to destroy us. During these few days, the survival of the world as we know it depended on three individuals under enormous pressure. But just how close the world came to complete destruction during those dark October days has only recently come to light. I had a written order that I could release it. And if there was an order to fire the torpedo I would do it without a second thought. The idea that a sub commander, could launch a WW3 was, yet another layer, of the ultimate danger. …and how another saved us all from nuclear apocalypse. At a top-secret naval base in the Arctic Circle, four Soviet submarines prepare for a mission known only to a handful of Communist party officials. The men on board have no idea where they are being sent. Their orders, the course of their journey, and the timetable are contained in an envelope to be opened only when they are out to sea. Valentin Savitski is commander of one of the subs—B59--and until he opens his orders, the destination remains a mystery. One of the only men who knows about the mission in advance is the captain of the entire submarine fleet. He will also be making the journey on board sub B59. My husband was a very shy and modest person, intelligent and smart, very polite. When we used to go on holiday wherever he was, he was always trying to find fresh newspapers, he was always in touch with the modern world. And like many submariners, he has his own rituals. Well, I don’t know whether to call it a superstition, but one day when I came home there was the smell of paper… I asked what was going on did something burn in the house? No he replied I’ve just burned all our letters. Why? I asked with tears in my eyes. He replied that if you keep the letters then that it is bad luck. And luck is something Vasili Arkhipov will rely on. He will be part of an operation that will bring the world to the very brink of complete and utter destruction. The Commies were bad guys, we all knew that, and we were the good guys. We wore white hats and they wore black hats. The Americans for the first time felt vulnerable. And you had the beginning, of the back yard bomb shelter craze where people in this leafy suburbs of Washington DC were building bomb shelters, back in their back yard, stocking it with canned goods and they were teaching school kids how to duck and cover under their desks. There was a level of paranoia. When we found out that America had built rocket launchers against us, that wasn’t a pleasant thing to know. Our country wasn’t preparing for any wars. It was always everybody else who was attacking us. Adding to the tension is the revolution in Cuba. Castro’s takeover means that a regime sympathetic to Russia now stands at America’s door-step. I think the Cuban revolution was the first genuine communist revolution that didn’t come, from Stalin’s tanks doing the take over. So the old commies in Moscow, looked at the young commies in Cuba and said yeah, hooray the new generation this is great. But with no proof, the Americans can only air their suspicions at a meeting at the UN. “If you have your missiles in Turkey, we have our missile in Cuba” and that was the game. Except for the weapon officers and commanders, nobody else was allowed to go in there. The commander, second in command, special officer… Nobody else was allowed in this room. Weapons with the same strength as the bomb dropped on Hiroshima. At that period of time, it was called 'special weapon' not 'nuclear torpedo', but 'special weapon'. At that time we couldn’t even imagine a nuclear torpedo. I had a written order that I could release it. And if there was an order to fire the torpedo I would do it without a second thought. For the first time in life a commander of a submarine had a nuclear weapon and had the authority to fire the missile on his command. The nuclear torpedo can only be launched if both the sub’s captain and its political officer are in agreement. A signal is then transmitted to the torpedo bay. On this voyage, the B59 requires an additional step. Vasili Arkhipov—the head of the fleet—has the power of veto. If these three men agree, they can unleash Armageddon. The world was protected only by the policy of mutually assured destruction--a deterrent meant to scare Russia and America from firing on one another. It means that if we have the capability of wiping out every meaningful target in the Soviet Union and they have the capability of wiping out any every meaningful target in our country, that we both launched our missiles at the same time and both countries are destroyed. …One single Soviet nuclear torpedo would trigger a response from the Americans leading to a cascade of destruction. The answer to the fist was to hold our own fist. That’s how it was. 50 miles from port, each commander is instructed to read his orders. …only 90 miles from mainland America. The plan is for these four submarines to serve as the vanguard of a Soviet force that will make Cuba one of the most militarized places on earth. This is a most important mission assigned by the Party and the Government. I am sure we will accomplish it. I rely upon you. But, getting to Cuba is a journey fraught with difficulty and constant danger of detection. Hunting them will be the most advanced fleet of American sub-hunters … destroyers, helicopters, surveillance planes all armed with the latest technology. Communications officer Gary Slaughter was on the USS Cony. We could not have been better prepared for their decision to bring those submarines to Cuba. John Stoessinger was an advisor to President Kennedy – he witnessed the inner workings of JFK’s government during the Cuban Missile Crisis. He was there when U2 spy planes returned with photographic proof that the Soviets had smuggled missiles into Cuba. They began to swear and cuss because, they didn't know a thing about it. And, quite frankly they swore like a bunch of unhappy truck drivers. That's the language they used. The Americans now have concrete proof that Soviet missiles could be launched from Cuba. Most Americans were outraged, but also very frightened. Very frightened. On October 14th the weather starts to change. Hurricane Ella begins forming in the Caribbean. At that moment the Atlantic was very disturbed a storm after a storm. The waves were going up to 5-7 meters. And the wind was making it even worse… But the ship sits low in the water up to 5 meters high and it was completely covered by the waves. We were going through with the hatch closed, because if you open it the water will get in immediately. The low cloud cover means American spotter planes are grounded. For us perfect weather is when there are waves, when there’s a storm. These conditi ons are ideal. But the conditions inside the submarines are appalling. During this storm we just couldn’t stand on our feet. In conditions like this you have to put your legs against the bulkhead and keep your back pressed against the fittings just to keep yourself stable. There is no radio contact from Moscow. …nothing is passed on to the four submarines. And then, on the 15th of October, Naval Command in Moscow finally makes contact. It seems Moscow is changing the mission. A little more than 2 weeks after leaving Mother Russia, the four submarines are ordered to hold their position in the Sargasso Sea and wait for instructions. But more time at sea means more chances for the Americans to find them. It shall be the policy of this nation to regard any nuclear missile lodged from Cuba against any nation in the western hemisphere as an attack by the soviet union on the united states requiring a full retaliatory response on the soviet union. So far everything had been kept secret. But, going public meant, that the whole country, would know about it. But also Prime Minister Khrushchev would know about it. I patched it through the public address system, all through the ship and it was sobering. I call upon Chairman Kruschev to halt and eliminate this clandestine and reckless and provocative threat to world peace and to stable relations between our two nations. We knew that this was the real thing that this was not an exercise. And so our attitudes changed we became more determined more professional we focused and we went to our stations, ready for action. Kennedy orders a ring of ships to surround Cuba and the Caribbean and stop the flow of any more Soviet weaponry. News that the Soviets smuggled nuclear weapons into Cuba explodes across the nation. And at the time, I was a school kid in 3rd grade in Elsmil Mississippi, they had me go under my desk, multiple times, that week in October 1962 because we were within range of those medium range missiles from Cuba. But the rising tensions are not reported in Russia. Kennedy increases America’s defense readiness condition from four to DEFCON 3 for the first time in history. 22 interceptor aircraft are ordered to patrol the seas. We never underestimated the Russians, we always assumed that they were strong as we were and it was our job to outwit them to out train them. It would be like two prize fighters knowing that nominally they had the same capabilities to knock the other guy out. Below the waves, the crew of B59 has been away from home for three and a half weeks. They weren’t getting communications from Moscow, they were listening to Miami radio stations. They were really cut off. On Miami radio the stories are about impending, US invasion of Cuba. On Miami radio it’s, descriptions of the flotilla off shore. It’s descriptions of total mobilization. We could not get any contact with Moscow and we had no idea what was going on. Everything I knew and everything I did was by listening to Kennedy on the radio. While the lack of contact with Moscow is a problem, the men are facing a more serious risk. A previous disaster aboard another submarine has made the chances of discovery much greater. A year before, a nuclear reactor on board the sub K19 – one of the first Russian nuclear subs –failed catastrophically… eight men died from radiation poisoning as they tried to fix the problem. 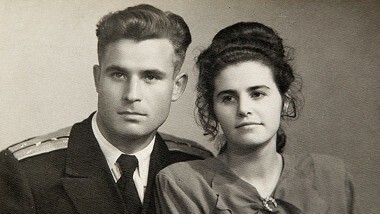 Vasili Arkhipov was aboard the K19 and witnessed the disaster. But despite the shortcomings of their equipment, the captains of the Soviet subs have one trick up their sleeves…they can perform magic…. The ocean is never consistent in its temperature. As you, if you took a thermometer and you, and you swam down to the bottom of the sea, erm as you would go down you would notice that the temperature changes. As anti-submarine warfare hunter we were always focused on the water conditions. The thermal conditions of the water. It’s the most, difficult thing to deal with when you’re in the anti submarine warfare business. So if a submarine can get below that thermal layer, they’re better off hiding under there. 85 percent of the entire Atlantic fleet is now on the hunt for any vessels that might attempt to break Kennedy’s blockade. Kruschev counters Kennedy’s quarantine with the threat that stopping and searching of any Russian ship will be considered an act of piracy. 40 destroyers, four aircraft carriers and 358 aircraft are now effectively hunting for any Soviet vessel that might be smuggling weapons. On October 24th Kennedy pushes America’s war readiness alert up to DEFCON 2. The temperature went up to 60-65 degrees. In the diesel section it was over 70 degrees. And it wasn’t just for 5 or 10 minutes, it was for hours, all the time the crew were under these conditions. Russia’s diesel electric fleet is designed to function in the cold arctic seas… temperatures of 37 degrees. The water temperature in the Sargasso Sea is in the mid-80s. The subs are beginning to overheat. The coolest part of the sub is at each end by the torpedo pods. There, it is only around 110 degrees. Crew members are allowed there for short periods of time. When I was at anti-submarine warfare school was the only time I was on-board a diesel powered submarine, for a period of just a day and it was awful, the stink of diesel oil and the smell of acid from the batteries and we were out just for the day and it was quite enough for me, thank you. Vadim Orlov was describing terrible conditions or a lot of us was describing, the terrible conditions on these submarines. That they were not made for, warm waters and they were terrible equipment that should never have been deployed and it was a height of recklessness to send this equipment off with nuclear capacity. What man in his right mind would send a diesel submarine on that kind of mission? Only a madman, only someone who doesn’t know the situation at all. Emergency dive, if you are surfaced takes about 30 seconds. Part of the ship takes on water and the ship practically sinks like a rock till a certain depth. Is it still in range? That’s why the situation was getting harder, and we couldn’t charge our batteries anymore. We had so many weapons and so many sonar’s... He was like a rabbit inside a small cage, and 15 of us hounds outside the cage, and 15 hawks above the cage that rabbit was dead. Sonar buoys – listening devices - are thrown into the sea. And the temperature of the Atlantic is continually analyzed. Our equipment was working perfectly, our, my sailors were doing a marvellous job of tracking this guy um, the water conditions were good so by the end of two hours, we really knew we had him. Flying at 70,000 feet over Cuba, a spy plane is shot down, killing the pilot. President Kennedy turned visibly white. He went pale. It was an act of war, by the Russians. Well now, this is much of an escalation by them, isn’t it? Major Rudolph Anderson is the first person to die in the conflict. All-out war is now a step closer. We got our solid contact at, roughly four or five in the afternoon. American reconnaissance reveals the possible presence of three enemy subs. What they don’t know is that their targets carry enough nuclear weaponry to destroy the entire Atlantic fleet. We were all exhilarated, there was no fear, err we knew our jobs, and we were just kind of rubbing our hands saying god we at last get a chance to, play what we’ve been practicing to do for all these years. And that’s what if felt like. We felt privileged, to be able to show our stuff. No submariner likes to be detected, period. Their business is stealth. When you found them they didn’t like it. As the men of B59 suffer in the heat, the sub has little power to escape the world’s most advanced naval fleet. ‘Hunt to exhaustion’. You would keep contact on the submarine until he had to surface because his batteries are going flat. So when his batteries were exhausted, he had to come to the surface and recharge his batteries. Kennedy has already ordered strict protocol upon finding an enemy sub. On no account should it be attacked, rather they should drive it to the surface. …We propose to use those as warning depth charges. I think we ought to wait on that today. We don’t want to have the first thing we attack as a Soviet submarine. Kennedy sends a message to Moscow: his Navy will now attempt to surface a Soviet sub. But Kennedy doesn’t have the entire story: Moscow has had no contact with her subs. We could only guess what was going on by watching what the Americans were doing. Only by what we saw could we judge what was going on. Is there a war? What’s happening? The subhunters have sonar devices capable of generating extreme, localized sounds. and every destroyer within any close proximity and there were three or four sort of circling around, us, were doing the same thing. The entire crisis is now focused on a single Soviet submarine, cornered and unpredictable. I saw Defence Secretary McNamara, take Dean Rusk to the side and said “The sun is setting, it could be the last sunset we will ever see.” And that's when I got scared. We weren’t’ trying to kill them we could we could have very easily killed that submarine, we wanted to harass it. We knew they were probably having difficulty breathing it was hot as hell in there, it was miserable, they were cramped together, and they had been under great strain for a long time. So what we were trying to do is basically apply passive torture. The typical response would be if he wanted to come to the surface, eh would fire a flare and we would say you’re clear to surface but that didn’t happen. The men aboard B59 are frightened and confused. With no new orders in over a week, B59 has no idea the depth charges are meant as a warning. we dropped the five practice depth charges to invite the submarine to come to the surface. There is a specific signal that we have, and that is 3 explosions, grenade explosions, which means you have to surface. He never lost it, he just made a decision. Prepare for battle-stations… the special weapons. Savitski was an impulsive man but in his mind - at that moment - he made a correct decision. He had no right because Vasili was in charge. He was the commander of the fleet of all the ships. But Savitski was the commander of this ship. the commander is the second in command after God” these are the rules the submarines live by. Vasili Arkhipov was our commander of the fleet. He was a submariner and a close friend of mine – he was a family friend. He stood out for being cool-headed, he was in control, he was a real submariner. Two of have agreed; do I have your permission? You need all three of us. and especially that he lived through that and saw it. He didn’t hesitate to say No! God only bless the man because err, what would have happened after that? We would have been a nuclear war with Soviet Russia, and there would maybe perhaps not be a world. We were already prepared to use nuclear weapons. We, had all of our strategic aircraft, ready to fly to Russia armed with nuclear weapons and, and ready to drop nuclear bombs on key targets and, and, and Russia. So there was no doubt in my mind that we would have gone had this incident occurred and we would have nuclear exchange with the Russians if their nuclear ballistic missiles worked. Their cover blown, the ordeal for the men of B59 is finally over. They weren’t six feet tall, seven feet tall and they didn’t have, have fangs coming out of their mouth. Now I personally never, had seen a Russian naval officer and as far as I was concerned and he was from central casting. Dour, squatty faced, and err, he, he was he looked pretty mean actually! one of the second class fire control technician was able to shoot some 8 mm film, and to see that film and that, that submarine going off away from our err control err was somewhat saddening, erm, because he was, he was our catch. Of the four subs that left Russia a month earlier, only one escaped detection. And none of the others came close to firing on the Americans. What heroism, what, duty they fulfilled, to go half way across the world and back and survive! And they were treated really shabbily in fact I think one of the Admirals or Russian and Soviet admirals told them at some point told the commanders it would have been better if you’d gone down with your ship. Extraordinary. “it would have been better had they drowned”, you see this is what they call a welcome. That’s why Vasili didn’t like talking about it; he felt they hadn’t appreciated what they had gone through. When I asked him about it he said “that’s enough”. Arkhipov – the man who saved the world - eventually succumbed to radiation poisoning from the K19 disaster. He became ill and died of kidney cancer – an affliction that took many others who served on the sub. It’s taken 40 years for the true danger the world faced to come to light. In 2002, Vadim Orlov, the radio operator from B59 told his story at a press conference. partial upsync It was specifically the nerve of the sub commander – head of the fleet – allowed us, well to prevent actually if you think about it, the start of warfare between… of this crisis. …Let alone that the actions of a single man prevented one from being launched. In Cuba, in honour of the 40th anniversary of the crisis, people gathered, there was the American minister of defense, McNamara, there were representatives from Russia. And they were talking about that, and they said that: the person who prevented a nuclear war was a Russian submariner, Vasili Arkhipov. I was proud and I am proud of my husband. Always.